This morning my running buddy came over so we could try to knock out a long run. It's supposed to be warm and muggy most of the weekend, so I sort of convinced her to just get it done this morning so we wouldn't have to get up super early tomorrow to get our long run done. Amy got to my house just after 5:30 and we headed out into the thick, soupy air. As a side note - my Garmin is messing up yet again. This is the replacement I recently paid for, second replacement I should add as the first they sent was a total dud. Now it's not charging, losing charge immediately and freezing. Garmin is completely losing my respect as a loyal customer. Ok, end of rant. We started off and since I had to use Jason's Suunto, which displays mph not mpm, I needed to rely on Amy's watch for our pace. After some stupid training mistakes this week already, I had warned her that I needed to slow my roll. We were going to shoot for 11 miles and I wanted them to be smart training miles not trying to race them. Of course, at the start we kind of kept letting the speed creep up, but then we'd pull back some. It was so hard to breathe, that I think that helped with slowing down. I was actually, surprisingly having a really good run. I didn't realize it right away, but Amy wasn't. She said she had to stop for a second, no complaints from me mind you. But when you're out running with someone, you almost always tend to feel bad when you are the one who needs to stop. But she's been there and done that for me. That's what running friends, and true friends do right? Often times we will hit intersections of traffic that give us a second to catch our breaths, but this morning somehow we were getting the green light like it was all planned out just for us. Figures right? So by the time we were hitting the long stretch of ascent heading away from the river, I could tell she was not having a good run and had to stop again (still no complaints from this girl). I felt terrible since I'm the one who convinced her to run with me. Otherwise, she would have rested and not been out there wanting to just lie down in someone's yard crying "Uncle." Yes, she mentioned that at one point. Maybe finding a lawn with sprinklers going too would have been ideal. And man have I been there. A couple of weeks ago, I stopped at mile 7 of 8 miles and literally just stood under a tree. Just standing. Like somehow I was going to miraculously get home if I just stood there long enough. The only difference was that I was alone and had no one to try to keep my spirits up or drag me to the finish. Where I'm going with this tale is not to point out that Amy is human (phew) and can occasionally have a bad run, but that we all can AND that having an awesome running partner is so important. In the past, the only person I ever ran with was Jason, then later Amy. But after she moved, my runs have become mostly solo. 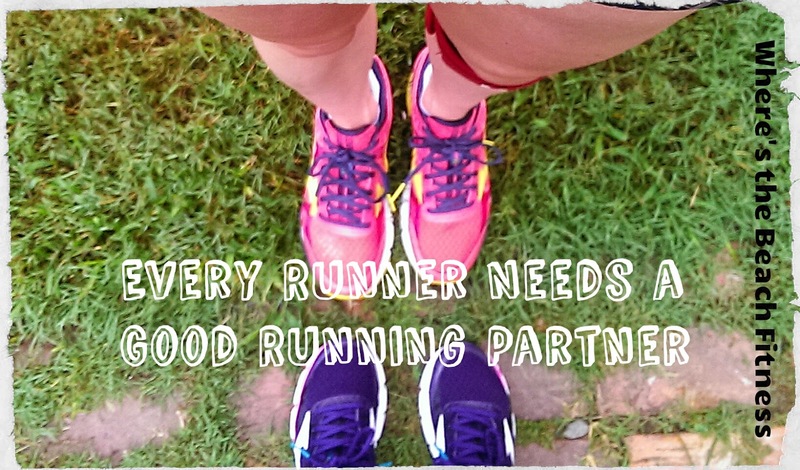 So, I definitely look forward to running with a partner when I have the chance. What's great about Amy is that I can always count on her, we can talk about anything (literally), it can help the miles go by and it's great support. I thought it would be fun to share what I think a great running partner is and what they do that no one else might do. 1. Wake up at 5 am to drive to your house to meet up for a run. 2. Agree to run 11 miles before work on a Friday after already running 4 days straight. 3. Help carry the water. We've done this twice now where I'll carry the bottle for half the run then she'll carry it for the other half. 4. Drinking out of the same water bottle (see #3) and not being grossed out one bit when said water bottle smells funky, not because of the bottle itself but the fabric handle. 5. In-depth discussion about GI issues with ease as if discussing clothes shopping. 6. Appreciating a beautiful sunrise and willingly stopping to take multiple pictures without complaint. 7. Willing to throw themselves on a vicious dog about to attack. Luckily she didn't really have to go that far, but when she said she was thinking about it, I kind of believe she would have done it! 8. Willingness to hold water bottle so that I can barf after intervals. She said she'd do this and I may put her to the test on it if my next speed work is anything like it was on Wednesday. 9. Agreeing to run in pretty much any and all weather conditions from freezing rain, boiling heat and torrential downpours. 10. And of course a great running partner will turn your Garmin off for you when you do fall out during a craptastic run. But most of all, a great friend and running partner is someone who's just there for you. They get you. They understand your crazy ways. Because, let's face it, they're just as crazy! So even if you're a solo runner, you don't care for groups, I still think it's important to have at least one running buddy to share crazy running adventures with. What would you add to this list? What would you do for your running buddy or what have they done for you? And I think we need a National Running Buddy Day to celebrate the crazy runner friends in our lives.